Snowboarding is a winter sport that involves descending a slope that is covered with snow while standing on a board attached to a rider’s feet, using a special boot set onto a mounted binding. The development of snowboarding was inspired by skateboarding, sledding, surfing and skiing. It was developed in the United States in the 1960s and became a Winter Olympic Sport in 1998. 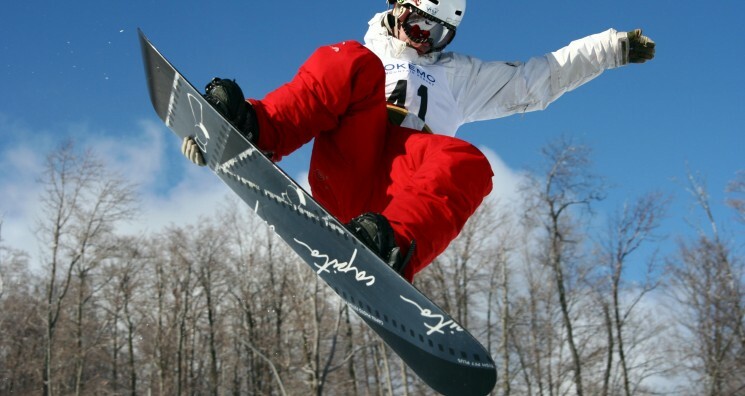 In 2002 competitive snowboarders formed the World Snowboard Tour. Snowboarding has been around since the 1920s, when boys and men would tie plywood or wooden planks from barrels to their feet using clotheslines and horse reins in order to steer themselves down hills. Modern snowboarding began in 1965 when Sherman Poppen, an engineer in Muskegon, Michigan, invented a toy for his daughter by fastening two skis together and attaching a rope to one end so she would have some control as she stood on the board and glided downhill. Dubbed the “snurfer” (combining snow and surfer), the toy proved so popular among his daughter’s friends that Poppen licensed the idea to a manufacturer that sold about a million snurfers over the next decade. And, in 1966 alone over half a million snurfers were sold. In the early 1970s, Poppen organized snurfing competitions at a Michigan ski resort that attracted enthusiasts from all over the country. One of those early pioneers was Tom Sims, a devotee of skateboarding (a sport born in the 1950s when kids attached roller skate wheels to small boards that they steered by shifting their weight). As an eighth grader in Haddonfield, New Jersey, in the 1960s, Sims crafted a snowboard in his school shop class by gluing carpet to the top of a piece of wood and attaching aluminum sheeting to the bottom. He produced commercial snowboards in the mid 70s. During this same time, Dimitrije Milovich—an American surfing enthusiast who had also enjoyed sliding down snowy hills on cafeteria trays during his college years in upstate New York—constructed a snowboard called “Winterstick,” inspired by the design and feel of a surfboard. Articles about his invention in such mainstream magazines as Newsweek helped publicize the young sport. Also during this same period, in 1977, Jake Burton Carpenter, a Vermont native who had enjoyed snurfing since the age of 14, impressed the crowd at a Michigan snurfing competition with bindings he had designed to secure his feet to the board. That same year, he founded Burton Snowboards in Londonderry, Vermont. The “snowboards” were made of wooden planks that were flexible and had water ski foot traps. Very few people picked up snowboarding because the price of the board was considered too high at $38, but eventually Burton would become the biggest snowboarding company in the business. In the spring of 1976 Welsh skateboarders Jon Roberts and Pete Matthews developed a Plywood deck with foot bindings for use on the Dry Ski Slope at the school camp, Ogmore-by-Sea, Wales. UK. Further development of the board was limited as Matthews suffered serious injury while boarding at Ogmore and access for the boarders was declined following the incident. The ‘deck’ was much shorter than current snow boards. Bevelled edges and a convex, polyurethane varnished bottom to the board, allowed quick downhill movement, but limited turning ability.